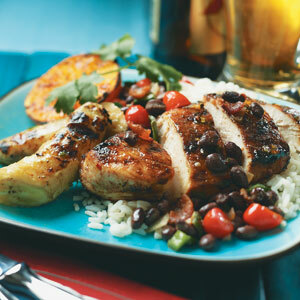 A little spice, a little sweetness, and a tangy sauce make this carnival of color and flavor your own island getaway — right at home! Plantains, a starchy bananalike island staple, are a typical tropical side dish. But grilled bananas taste great too, and are a fun alternative to plantains that everyone will eat. Whisk all ingredients for the mojo together in a bowl; set aside. Combine sugar and spices for the chicken in a bowl, then rub chicken with the spice mixture. Lightly coat bananas and chicken with nonstick spray. Grill the chicken and orange halves for 5 minutes, then turn the chicken over and baste with mojo. Transfer oranges to a platter off heat. Cook chicken 5 minutes more, or until cooked through, turning and basting once or twice. A few minutes before chicken is done, grill the bananas, basting with mojo sauce and turning often to char. Cut bananas into chunks before serving. Whisk the ingredients for the mojo together to incorporate. The citrus makes it very bright tasting. Rub both sides of the chicken with the spices, pressing them onto the meat so they adhere well. Grill the chicken and oranges, basting the chicken often with the mojo sauce.